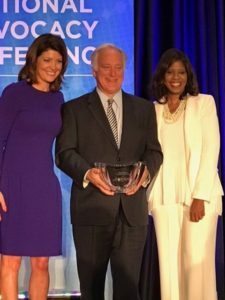 WASHINGTON, D.C. – The American Medical Association (AMA) presented Texas State Sen. Kirk Watson with the Dr. Nathan Davis Award for Outstanding Government Service. Watson was selected for the AMA’s top government service award for asserting his community vision for health care and economic prosperity, most notably for leading the successful effort at the University of Texas Austin to build a new medical school from the ground up. As part of his “10 Goals in 10 Years” initiative, Sen. Watson also put forth a vision to develop laboratories and other facilities for public and private research, provide needed psychiatric care and facilities, make Austin a center for comprehensive cancer care, and build a modern teaching hospital. The hospital – the Dell Seton Medical Center at The University of Texas – will open this year. Watson is one of 10 honorees chosen this year to receive the Dr. Nathan Davis Award for Outstanding Government Service. The award, named for the founding father of the AMA, recognizes elected and career officials in federal, state or municipal service whose outstanding contributions have promoted the art and science of medicine and the betterment of public health. Sen. Watson was presented with the award last night at a ceremony in Washington, D.C. as part of the AMA’s National Advocacy Conference.